In an unusual move for TTC Board meetings, two officials from Bombardier addressed the meeting [YouTube video] to discuss the status of the Flexity streetcar order. Benoit Brossoit and David Van der Vee, President and COO of Bombardier Transportation’s Americas Division, spoke at some length. The key point throughout was that the amount of welding to be corrected in 67 of the new cars is a small percentage of the total welding overall, and there is no safety risk with current operations. The problem arose from a combination of the TTC’s tight specification for the operating environment of their vehicles and the use of stronger, more corrosion-resistant material than is found in the standard product. This produced demands on manufacturing quality that were not recognized early in the process. Bombardier and the TTC discovered the problem and were working on a fix while manufacturing continued leading to a series of cars that will require some degree of repair. Bombardier expects that as they progress to more recently-built vehicles, the repairs will become simpler. Although they would not commit to an improvement in the schedule beyond the preliminary estimate, they hope that the turnaround time will be reduced as the program goes on. As reported here in a previous article [Bombardier Undermines Streetcar Credibility], the cycle time is estimated at 19 weeks of which 7 are for transport to and from the La Pocatière plant and acceptance testing when they return to Toronto, and 12 are for the actual repair. TTC Board members questioned Bombardier at some length, but without the rancour one might have expected given the frustration of a long wait for new equipment and the service problems this brought to the TTC’s surface operations. The TTC deferred a decision on whether to proceed with a 60-car add-on to the current order to 2019, but some Board members took advantage of the situation to raise the question of whether streetcars should be retained on all routes. In effect, the system would be trimmed to fit within the available fleet’s capacity. Staff were asked to examine the comparative costs of streetcars and buses, including life cycle costs, and they agreed to report back on this. As the streetcar system will stand in about a year’s time, both the fleet and infrastructure will be in good shape requiring only ongoing maintenance (both operating and capital for major repairs), and Toronto will not face a large cost to rejuvenate an aging system, the typical death-knell for streetcars in many cities. However, without more cars, the TTC will be limited in responding to population growth along streetcar lines and infrastructure which could provide more transit service will go underused. A related political issue will be the perennial motorist-vs-streetcar debate and the design problems of surface transit operations on roads that have limited capacity and competition from many users including cyclists and pedestrians. This problem extends beyond streetcar routes, but they are a convenient target commonly accused of making motorists’ lives a misery. Whether Toronto is ready to face the problem of declining street capacity for cars as other modes become dominant is a question for the new Council. The topic of bus bunching on streetcar routes came up, and staff offered one of their usual excuses that this is caused by “construction”. The only problem with that claim is that there have been no interruptions of 506 Carlton, other then the extension to Victoria Park Station, caused by construction. There will be a period of about three weeks starting later in July where the 506 bus will divert around construction at Gerrard & Broadview, but that is the first such case this year. As for the 505 Dundas bus, it has only recently been affected by construction on Broadview. As my analyses of these and other routes have shown, bunching is a chronic problem that originates in part through uneven departures from terminals, and from buses failing to maintain spacing over the course of their trips. This affects routes through the city, not just downtown. But “construction” is an easy excuse. Staff dish it out, and Board members buy the explanation. The delivery status chart included in the CEO’s Report shows 80 cars delivered as of June 26, 2018. Car 4489 has arrived in Toronto as of July 10. The latest schedule calls for the total to reach 100 cars by the end of September (3Q18) with 21 more by yearend, and the remaining 83 in 2019. This will be offset by the pool of cars that will be out of service for repairs at Bombardier. If the TTC does extend their order for Flexitys, deliveries would continue on from the end of the current production assuming the order is placed early enough that the supply chain is maintained for component parts. If the TTC and Council delay their decision, then a break in production could occur in 2020. In a report on the future of the Hillcrest Complex, TTC staff contemplates shifting operation of 512 St. Clair to Hillcrest once part of that property is freed up from current use by the shift of some activities to other sites. A study detailing the options is “in the process of being finalized and can be provided upon request” according to the report. When this is available, I will review it in a future article. The original Harvey Shops handles major streetcar repairs and some bus work. Duncan Shops, which replaced Parkdale Garage in 1987, is the main bus and engine repair location. It also includes General Stores which will move to a new location on Sheppard West in 2020. Davenport Garage is a small facility that operated from 1925 as an adjunct to St. Clair Division (the carhouse at the north end of Wychwood Park, a short distance away). It was decommissioned in 1993, and parts of the building have structural problems. Possible future uses are for administrative space and/or a TTC museum. The rail bending facility is used to create curved tracks for the streetcar system and the nearby area is used to pre-assemble special work (intersections) before this is shipped to work sites as panels. Replacement of this by an updated facility is now in progress. Other buildings support administrative functions including revenue services (Patten Building) and Transit Control (Gunn Building). There will be changes to this site as the fleet evolves. 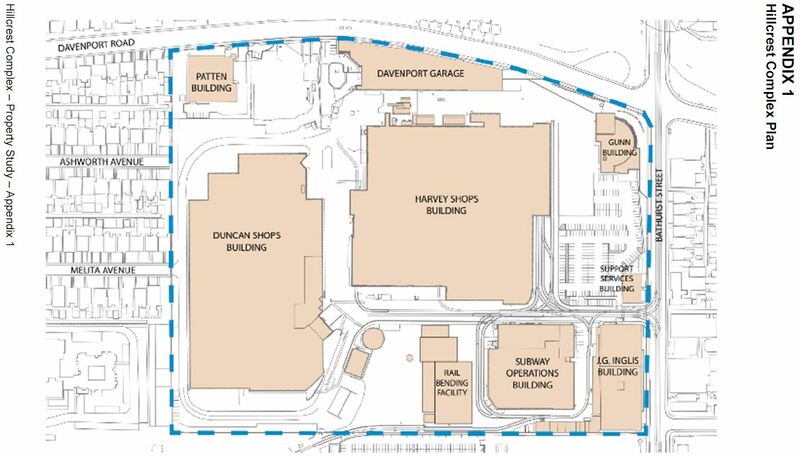 Harvey shops cannot handle the larger Flexity streetcars except in two bays in the northeast corner of the building, and Leslie Barns is the site for major repairs to this fleet. As and when the bus fleet transitions to electric operation, the mix of work for Duncan Shops will change. Ironically it was Harvey Shops where the trolley coach fleet was maintained for decades. The nominal Flexity capacity of Toronto’s three carhouses will handle 50 cars at each of Russell and Roncesvalles, and the remaining 104 cars at Leslie. However, Leslie must also reserve space for heavy maintenance, and the full proposed 60 car addition would overload that site. Moving 24 cars for 512 St. Clair to Hillcrest would relieve this pressure but would require a change in some of that property. To give a sense of scale, four Flexitys would fit in the north-south length of Harvey Shops, and therefore six tracks of that length would be required for storage. This move would also substantially reduce the operating cost of the 512 by shortening the dead mileage to an existing carhouse. The TTC has three types of buses in their plans with deliveries in various stages. This is summarized in the chart below from the CEO’s report. Deliveries of Clean Diesels will continue into late 2018, but after that point the TTC will switch over to Hybrids for 2018-19. The Battery Electric buses are not expected to begin arriving until 2019, and in any event the electrical infrastructure must be installed in the three garages where they will operate. Design work with Toronto Hydro is now underway. A report on potential sites for the next bus garage (beyond McNicoll Garage now under construction) was largely confidential because it deals with possible sites and property acquisition, but it contained an overview of the garage plan. This plan shows the service requirement for buses including spares for the coming decade. The red sections illustrate problems with severe crowding at garage sites, while the yellow shows cases where space is tighter than ideal. However, this plan provides for only minimal growth in service requirements in the early 2020s even though there will be no new rapid transit lines opened after the Crosstown in 2021 (and possibly Finch depending on whether that project survives the new regime at Queen’s Park). 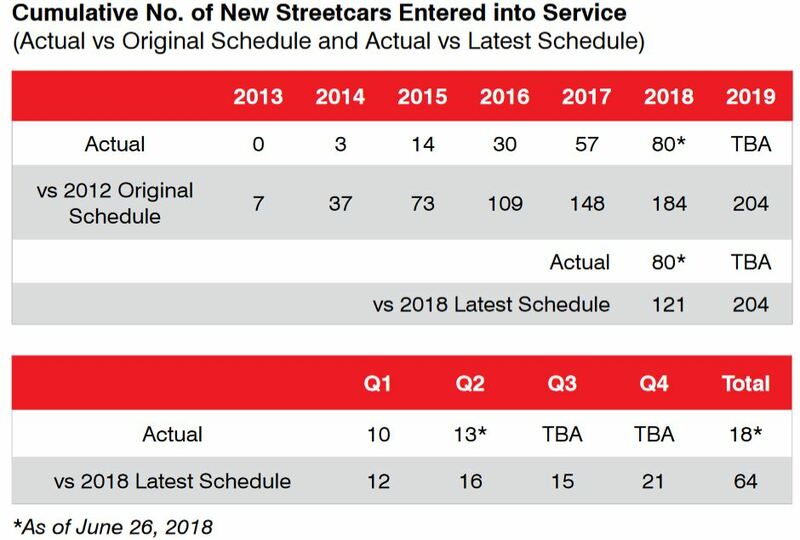 There is also an inconsistency about the fleet requirement for 2021 which is shown as “2015” numerically, but the bar chart has a value of about 1990. I have asked the TTC to clarify these issues. If, for example, a stronger growth rate were required for the bus fleet in the next decade, would the TTC continue to be in a position of saying “we would love to run more service, but we can’t store the buses”. This constraint has allowed the TTC to cap service growth, and indeed was the reason given for Service Standards that do not return to the Miller-era level for peak service. 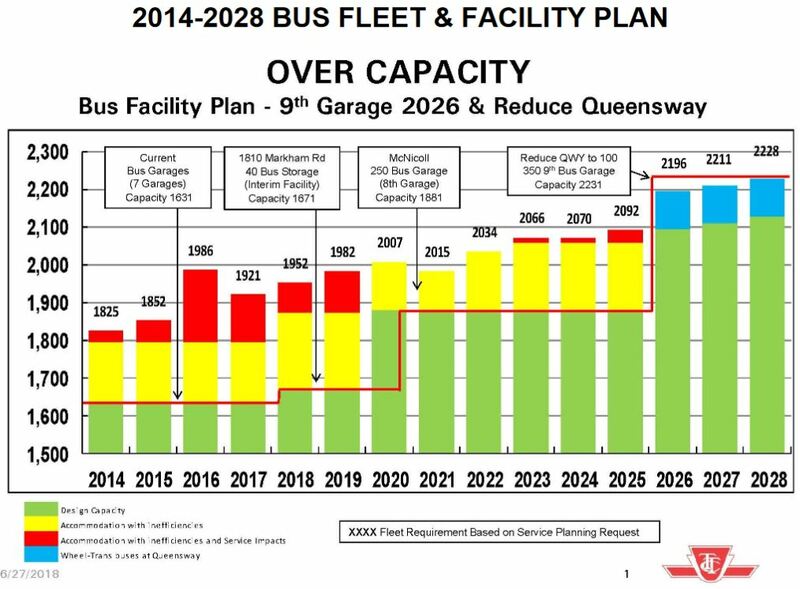 The chart also shows that the TTC plans to expand the WheelTrans fleet into space at Queensway Garage leaving only 100 conventional buses at that site when the proposed ninth garage opens in 2026. That garage could be the first purpose-built facility for an electric bus fleet, but the TTC would have to make a technical call on the design in the early 2020s. 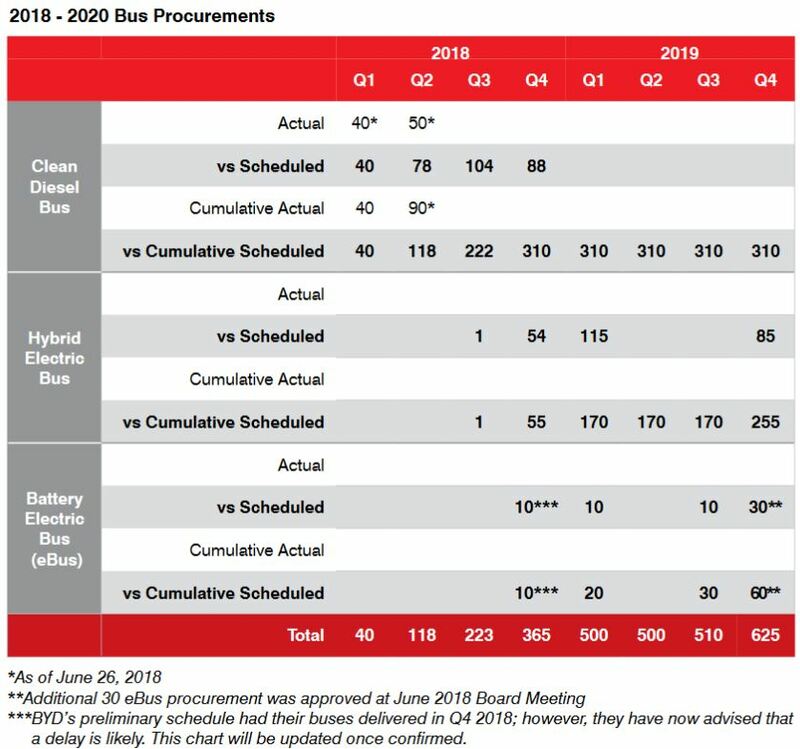 With a 350 bus capacity, this would also imply a large commitment to eBuses on the assumption that the technology will be mature enough at that time. Many of the issues listed here have been known by TTC management for some time. A chronic problem with TTC subway planning going back at least to the era of former Chief General Manager Gary Webster is that various aspects of capacity planning have not been integrated. Politically, it suits the TTC to avoid presenting a consolidated view because the total cost would terrify politicians. That was Webster’s explicit goal when, with difficulty, he obtained funding for the first chunk of the resignalling that simply upgraded the existing antique equipment on the 1954 era Yonge line. Fleet plans were out of sync with other technical plans. When the TYSSE (Vaughan extension) was planned, there was no provision for ATC, and the TTC assumed it would be using some of the existing T1 fleet (which now serves Bloor-Danforth) on the Yonge line. With the move to ATC, and the inability to retrofit this to the older trains, the TTC created a shortage of new TR trains for Line 1 and a surplus of T1 trains for Line 2. This was compounded by switching Line 4 Sheppard to 4-car TR sets displacing the T1s originally on that line. The additional trains strained yard capacity forcing an expansion at Wilson Yard. They also forced the reactivation of Keele Yard (among other changes) to handle the T1 overflow from Greenwood. Original claims for ATC talked of 40 trains/hour or 90 second headways. This is based on a few international cases where such headways are achieved, but not over entire lines let alone with trains having to stop in stations. Over the years, the TTC cut back its claims to the point where the current target headway is 110 seconds or 33 trains/hour. However, the TTC does not own enough TR trains to actually operate this level of service, nor does it have yard space in which to store them. TTC management’s opposition to a Relief Line in years past came directly from the assumption that they could increase service on Line 1 to the point where no parallel capacity would be required, and Gary Webster made this argument publicly. There is no provision in the design for the Richmond Hill extension for the extra trains needed to support more frequent service. A 110 second headway will strain the capacity of terminals due to conflicting movements (crossovers), and will require a much “tighter” turnaround operation. This affects crewing, especially with one-person train operation where drivers will have to walk the length of the platform to change direction. Padded schedules that create queues on the approach to terminals will have to be changed to avoid lengthy delays caused by trains arriving early. Running more trains requires more power, and the electrical distribution system may have to be upgraded. Delivering more passengers to key stations per hour will strain station capacity to clear platforms between trains. This will be a particular problem at Bloor/Yonge where no added train capacity will be available on Line 2 to move passengers away from the station even if Yonge Station gets a second platform (like Union) and additional circulation space between the two lines. St. George faces similar problems. The additional passenger load will almost certainly trigger a review of fire code related issues such as multiple exits from platforms at stations like Dundas and College. From an operational point of view, new exits must deliver riders to places they actually want to go so that they do not continue to use existing, crowded paths out of stations. Additional trains and the heat they generate, not to mention more people moving through stations and the possible future addition of platform doors, all contribute to the ventillation and cooling load on busy stations. On Line 2, several overlapping projects including ATC conversion, a new fleet, a new carhouse and yard, and the Scarborough extension have not been viewed as a package. Funding and scheduling for these projects does not reflect the timing required to complete them, notably to support the SSE’s 2026 opening date. A consolidated plan has been in the works since sometime in 2017, but has never been brought forward to the TTC Board or Council. It will require significant changes to the timing of spending and the need for funding. In the Star, Ben Spurr has written about the Line 1 ATC project and concerns that it will not deliver as much as is expected, or at least not without added costs. This ties in directly with the list of issues above, many of which have been covered on this site in past years. There is no excuse for this situation, and blame, if we must assign it, goes back through years and generations of TTC management, compounded by a Board that prefers “good news” to a hard debate and strategic planning. This entry was posted in Buses, Fares & Fare Collection, Finance, Service Cost and Quality, Streetcars. Bookmark the permalink. I am often on late night walks in my neighbourhood along Vaughan Road. For those not familiar, the Vaughan service is virtually “protected” for the entirety of it’s trip. (It runs in the 512 ROW from St. Clair West Station to Vaughan/St. Clair; and runs through a neighbourhood that does not allow for N-S through traffic (thanks to the ravine to the north) and has NO major intersecting streets between Bathurst/St. Clair and Oakwood/Vaughan; -AND- it’s northern terminus is an “internal loop” (left, right, right) on a side street (Jesmond) that doesn’t go through Oakwood (no major traffic interference in looping). There are two major population centres: at Winona (near Oakwood) and in the Wychwood block (within 500m north of St. Clair) and apart from that is sparsely [read: single family homes] populated. Drivers “in the know” know it is a quick/unobstructed way to get from Dufferin/Eglinton to Bathurst/St. Clair, but this demographic does not represent a significant volume of traffic. It is consistently the case that buses travel in pairs. Dead heading in one direction, and milk-run on the way back — always paired. During peak periods, this is useful, as you will often get two completely full buses in the morning/evening rush; however, in the evenings, and outside of peak this always results in paired vehicles where there are three people on one bus, followed immediately by an entirely empty bus. To say nothing of the pairing also resulting in up to 10-15 minute gaps between pairs. Terrible waste of resources, as one bus is invariably wasted space, run so closely to it’s leader that the gap it leaves is enormous. It would be interesting, Steve, to see a route analysis for 90A as a Case Study for Route Management. There is absolutely no reason for bunching as there is (practically) no construction on Vaughan (the 90B to Eglinton is discontinued until the Crosstown is open), no obstruction, no adverse traffic interaction. The only cause for this routine bunching is poor line management (and the absurd -5/+1 “on time” KPA). I note that the City of Moscow’s official website claims 90 second headways. From the same source, I see that they are also replacing their tram fleet. Presumably their supplier is not Bombardier. In London, the Victoria Line is timetabled at 36 tph, or 100 second average headways during the 0839-0930 AM peak. Here is a video of someone putting a stopwatch on the actual trains for an hour to see if this is achieved. Steve: Without seeing the track and service arrangement where Moscow hits 90 seconds, it’s hard to tell whether this is a direct comparison. For clarity for readers, when you say “replacing” trams, they are buying new ones, and, no not from Bombardier. The article is also intriguing because it talks about co-ordinated schedules to ensure even spacing of trains from branching routes, and cites an increase in passenger capacity as a result. Scheduled even spacing between trams – what an amazing idea! As for the Victoria Line, note that at Brixton Station where the video starts, there are two separate platforms from which trains depart as it is the terminal. The combination of track geometry and train length is likely such that TfL can achieve a fast turnaround. In Toronto, those long approach crossovers and our long trains combine to add to the turnaround time. Another point is that two trains can leave close together followed by a longer gap depending on whether there is a conflict in moves or not. In Toronto, it is possible to get trains closer together than 120 seconds at some points on the line, and the TTC used to do this under the manual control rules in the early days when a single red signal meant “stop and proceed”, not “stop and stay”. I have seen trains at Bloor with one departing and another arriving on the same platform. It was physically possible. However, this cannot be sustained because eventually the clump of closely spaced trains reaches a place like Union where the signalling is more restrictive. Even with the “stop and stay” rules, the fact that a train can be inserted along the line at Davisville southbound allows for closer headways than if it originated at Finch. There is also a Catch-22 at Finch (and other terminals) if you try to store spare trains in the tail tracks. When these are occupied, the signal system enforces a slower rate of entry to the station than otherwise, and this adds to turnaround times. When the TTC stashes a train out of service in a tail track, it can really mess up peak period service. There are a lot of subtleties in very close headway operation, and it cannot be assumed to be possible in all circumstances. YES to your comment a thousand times over. I also live on the 90 route. It is supposedly 10-minute-or-better service but when I go to leave the house, my transit app regularly places the wait time at over 10 minutes with bunched vehicles. The most egregious in recent memory was *three* buses not coming for another 18 minutes (and this was not at rush hour, mind you). As another brief anecdote, last weekend, I walked north from Queen St along Bathurst all the way to Bloor and not a single northbound 511 passed me. It wasn’t until I was seated on a 7 bus that three 511s rolled into the station. I have not lived in Toronto for very long, but I really cannot fathom how or why people who spend decades living and voting in this city tolerate the inability of the TTC to manage headways. For some context on Victoria Line’s 36 trains per hour, see Reconnections’ write-ups. A brief summary: there was considerable construction at Victoria Line’s northern terminus to enable this. At that service level you run into things like trains not being able to leave the terminus at exactly the same interval, because every other train has a longer way out through the crossover, so the ‘straight’ trains must hold for a few seconds at the next station to avoid bunching. Speed of clearing passengers from platforms between trains also becomes a limiting issue – with some of busy downtown Toronto stations having 1 exit, that means many millions of dollars. Compared to London, Toronto has the advantage of storage tracks where trains can be inserted along the route rather than at termini, but this is really difficult to time. You need a gap where the extra train slots in, but the first train building the gap is gets relatively more crowded and causes bunching behind it. This is one reason the extra trains are mostly used as platform-clearing saviours – in that case the gap had often already built up. For a more local comparison, Vancouver’s Skytrain runs at 108 seconds (33.3 trains per hour) on full automatic, but their limiting terminus has a trailing track that trains pull into to reverse (so departures from terminal are never blocked), and the trains themselves are shorter so they don’t have to drive as far into the tail track to be able to reverse. Thales claims the signal system can do 75 seconds (48 tph) but I really don’t think there is terminus capacity for that. As comments on some of the Reconnections articles point out, at some point the capacity improvements on an existing line get so expensive (consider also the impact of closures and limits during the reconstruction) that it would have been better off to just build a whole new relief line. As I recall Steve also makes this argument about the idea of a $1B rebuild of Bloor-Yonge. Steve: Thanks for this link. It is refreshing to see a much more detailed examination of the challenges of running close headways than I have ever encountered in Toronto. I don’t think that the most basic operational simulation of a terminal pushed to its limits has ever been conducted, let alone a real world test of sending a batch of trains out in the middle of the night to attempt closer headways. Many of the BS claims abut capacity on the existing subway arise because of inadequate analysis, and this compounds into a resistance to criticism when the claims have been “sold” politically as a way to get funding for renewal projects. That’s how the whole resignalling mess on line 1 started. Aside from Bloor-Yonge constraints, another issue is that Line 1 is very long, and it only needs a more intensive service over part of the line in one direction. However, given the way it would likely be operated by the TTC, it would have close to the maximum service over the entire route, and this really drives up the number of trains required. Those trains could be running on a “relief line”, if it existed. The Moscow metro achieves short headways mostly because of much better operational discipline. There is a count-up clock at the end of the platform which gives the exact time since the previous train left the station. This is a key device used by the driver to judge how long to dwell in the station to avoid overrunning the next train, when to depart, and presumably whether to run faster to catch up to headway. As another example, crew changeover takes less than 10 seconds; as the train arrives, the new operator must already be standing on the platform ready to shake the hand of the departing operator, get in the seat, and start driving. I don’t think the metro uses short turns. From what I remember, all trains run to the end of the line, but because they extended many lines incrementally, there are many unused reversing sections in the middle of lines. I’m not sure about the signaling system, but the descriptions I’ve found make it sound like fixed block, with visual signals and safety measures more or less the same as what Toronto and New York run now. Since it’s fairly old, pre-computer technology I don’t see how it could be a moving block system. Presumably the positioning of the fixed blocks would be well-thought-through to avoid having trains stop in illogical locations (e.g. stopping just before a station when the previous train has already left the platform, as sometimes happens in Toronto). Other seemingly minor differences would probably contribute to make the difference between a 90-second headway being routine and it being impossible. For example, it seems like the door-closing procedure on the Toronto Rocket trains is way too long to work with a short headway. The long safety announcement plays, then the doors chime, and finally the doors slowly slide closed. If someone interrupts the door, the doors re-open and the operator has to restart the whole procedure from the beginning, playing the announcement again, hoping no one interrupts the door again… it’s not implausible to lose 20 seconds just trying to close doors. I don’t see how a moving block system can compensate for this kind of stuff, and a significant amount of time could be saved just by adding a ‘fast door close’ option for such situations that skips the announcements. Moscow trains also accelerate/decelerate/travel faster than the Toronto ones. I guess the analogous technology in Toronto would the High Rate operation that was trialled on the Bloor-Danforth subway at one point. Interstation distances are very long (more like York Mills to Sheppard than Bloor-Danforth station spacing). It’s not clear whether this works for or against frequent operation — it’s more probable to have two trains on the same interstation segment (i.e. more potential for train-to-train signalling conflicts without a station platform in between the trains), but the train spends more time travelling and is more likely to catch up to headway by the next station when there was a delay at the previous one. This is the clearest video I was able to find of Moscow’s short headways in operation. Steve: A few points here. First off, multiple farside tail tracks certainly will aid in terminal operations, but the important part as you note is discipline. Close headways are possible with block signals depending on how they are set up. The TTC’s block signals will actually let trains get closer together, but many years back the TTC changed its operating rule so that a single red means “stop and stay”, not “stop and proceed”. This was in part in reaction to the Russell Hill crash which itself arose from bad signal design (block length and location), poor maintenance, and poor operator training. The rule change improved safety but added to the enforced spacing between trains. Fewer, widely spaced stops helps, but dwell time discipline is important. In the video I noticed that although this is a busy station, the dwells are about 20 seconds tops. The signal lets the next train in fairly soon after and this allows more time for dwell in the station rather than on the approach as at Bloor-Yonge. It is ironic that with ATC, the train spacing will be able to revert to what we used to see a few decades back, but there will still be problems with station capacity. In the video, the impression I had of that station is that it would not take long for that platform to become badly crowded if there were a service interruption, and it would be interesting to know how Moscow handles that type of situation both for train management and crowd control. I find it very impressive, even if this were to be a relatively “quiet” subway station at the particular time the video was shot. What’s sad is that if you were to replace all the subway trains shown with buses, you would have a more realistic representation of the bus transit experience along some of the routes in this city – one bus immediately followed by another bus and yet another bus within a short period of time The difference is that after Bus #3, there would be a long space with nothing happening for multiple minutes and the crowd on the platform would steadily grow until the 3-bus caravan appears again, crowding everyone onto the first vehicle to arrive and leaving the trailing two relatively unaffected. As you noted, Steve, the issue (especially for bunched buses) is if there is a delay farther along the line and trains (or buses) are not allowed to progress at “normal” speed. Mind you, that might actually result in the trailing buses being forced to pick up the overflow people who can’t fit onto the first bus! Why doesn’t the TTC choose ONE bus route (say Dufferin) and ONE streetcar route (say Queen, west of Humber Loop) and institute a complete and active line management system for an entire week, tracking on-route arrival and departure times at the subway stations/terminal points and at each stop – or select mid-way stops – and figuring out what’s going on? Even better, don’t tell the drivers what’s happening and make it a real-life real day example for 7 days. Can you imagine the CEO report on that activity? As Steve has said – and shown via his analysis and charts and graphs too many time to count – consistent line management is key, in particular for buses and streetcars. The TTC, however, consistently shows that they don’t believe that this is an integral component of day-to-day operations and they cross their fingers, hoping that nothing bad happens or that, somehow, the drivers will just “do the right thing.” It’s like Lucille Ball (“Lucy”) and Ethel working on the chocolate factory assembly line, except that, instead of it being funny to see them stuff chocolates into their mouths and down their tops and wherever to deal with the never-ending onslaught, on the street are frustrated transit commuters wondering if they will be late for work yet again…. Steve: An important distinction in any line management scheme is that the TTC really needs to move to headway management. “On time” is meaningless for frequent service. It’s the reliability of spaces between trains/streetcars/buses that makes the difference. As for looking at current behaviour, of course, the kind of analyses I have been doing have been within the TTC’s power for years. Headway management is good for lines that run on rights of way or for frequent service that is not greater than about twice the traffic signal timing. If the headway is less than twice the signal timing it becomes impossible to keep to a standard headway. What they need to do then is manage the line so that gap length is not too great. This could be helped by the running of the express services because this would allow express buses to pass locals and keep the headway on the local to more than twice the signal time. For lines with a 10 minute or greater headway I believe that “On-Time” becomes more important because regular passengers become used to having the service arrive at a specific time. Clock face service is important to build up ridership as riders would not need to consult a schedule.